Recently, NASA used a 3D printer to make parts for a rocket engine, which performed just as expected. They also plan to launch a 3D printer into space next year, in order to help astronauts manufacture spare parts on the ISS. Yes, that's how cool a 3D printer is, and you haven’t heard everything yet. 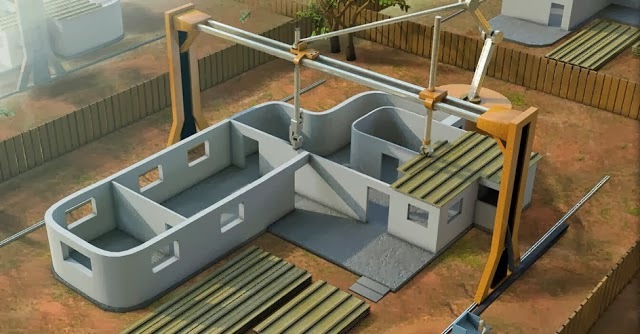 Thanks to a company named “Contour Crafting – Robotic Construction System”, the 3D printer can now be used to built entire houses on site, and it will take around 20 hours for a 2,500 square feet home. I don't know how many people fully comprehend the implications of this technology. It's not only much better, faster and cheaper than today's “traditional” technology, but it also has the potential to liberate mankind from physical labor. It is only a glimpse into the future, but we can imagine the rest. Because machines are faster and better than humans at repetitive tasks and heavy industry, it is inevitable that sooner, rather than later, we will all be replaced by them. This doesn't mean that we should fear technology. By contrast, we should embrace it and allow ourselves to be liberated. Unless we consider a viable alternative today, a huge percent of people will find themselves homeless and unemployed, in the near future. Luckily, there is a solution for all to study and take into account: “The Venus Project”. TVP is the model for a futuristic society than can be achieved within 10 years, if we decide to accept the “upgrade”. Because it is built around a Resource Based Economy, there will be no more financial institutions – hence no more elites, corruption, low quality products, wars, poverty, famine, etc.. Given the fact that we already have a viable transition plan towards a RBE, the only questions remaining is “how bad do we want it?”. It is only up to us to make the transition.